This fifteenth article, which is part of the series on Linux device drivers, experiments with a dummy hard disk on RAM to demonstrate the block drivers. After a delicious lunch, theory makes audience sleepy. So, let’s start with the code itself. Code demonstrated is available at dor_code.tar.bz2. This tar ball contains 3 ‘C’ source files, 2 ‘C’ headers, and a Makefile. As usual, executing make will build the ‘disk on ram’ driver (dor.ko) – this time combining the 3 ‘C’ files. Check out the Makefile to see how. make clean would do the usual clean of the built stuff. Load the driver dor.ko using insmod. This would create the block device files representing the disk on 512 KibiBytes (KiB) of RAM, with 3 primary and 3 logical partitions. Checkout the automatically created block device files (/dev/rb*). /dev/rb is the entire disk of 512 KiB size. rb1, rb2, rb3 are the primary partitions with rb2 being the extended partition and containing the 3 logical partitions rb5, rb6, rb7. Read the entire disk (/dev/rb) using the disk dump utility dd. Zero out the first sector of the disk’s first partition (/dev/rb1) again using dd. 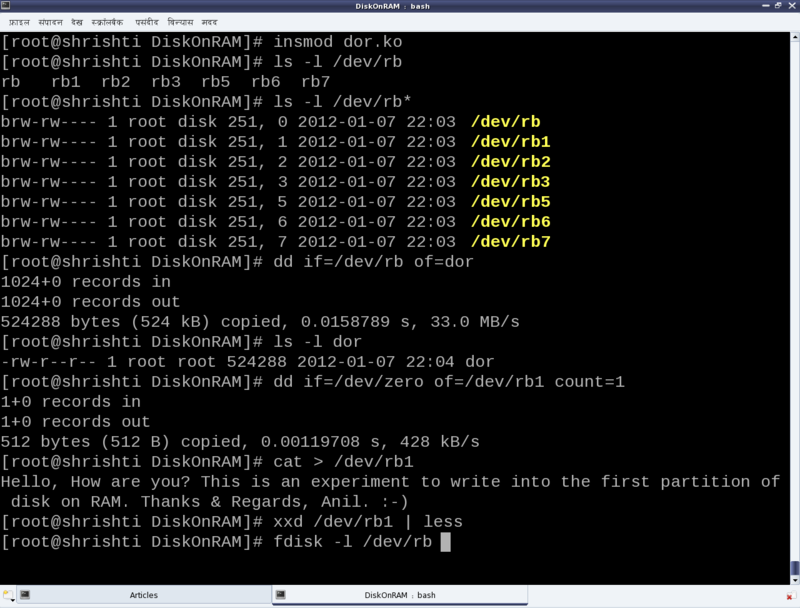 Write some text into the disk’s first partition (/dev/rb1) using cat. 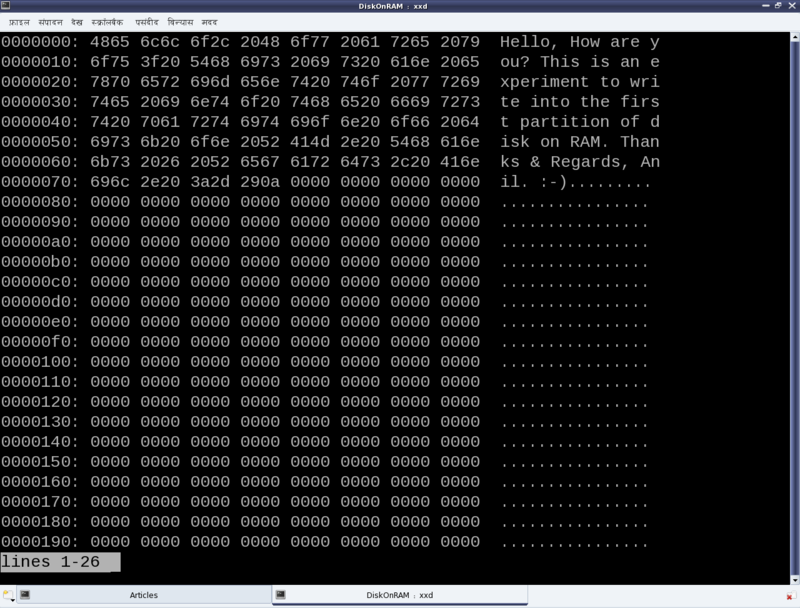 Display the initial contents of the first partition (/dev/rb1) using the xxd utility. See Figure 26 for the xxd output. 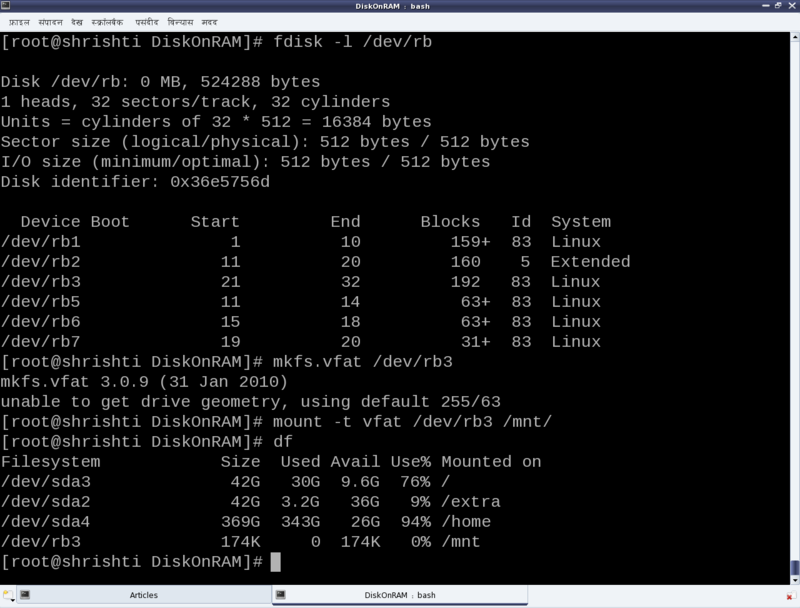 Display the partition info for the disk using fdisk. See Figure 27 for the fdisk output. (Quick) Format the third primary partition (/dev/rb3) as vfat filesystem (like your pen drive), using mkfs.vfat (Figure 27). Mount the newly formatted partition using mount, say at /mnt (Figure 27). Unloading the driver using ‘rmmod dor‘ would vanish everything. Though the partition needs to be unmounted using ‘umount /mnt‘ before doing that. Please note that all the above experimenting steps need to be executed with root privileges. We have just now played around with the disk on RAM but without actually knowing the rules, i.e. the internal details of the game. So, let’s dig into the nitty-gritties to decode the rules. Each of the three .c files represent a specific part of the driver. ram_device.c and ram_device.h abstract the underlying RAM operations like vmalloc/vfree, memcpy, etc, providing disk operation APIs like init/cleanup, read/write, etc. partition.c and partition.h provide the functionality to emulate the various partition tables on the disk on RAM. Recall the pre-lunch session (i.e. the previous article) to understand the details of partitioning. The code in this is responsible for the partition information like number, type, size, etc that is shown up on the disk on RAM using fdisk. ram_block.c is the core block driver implementation exposing the disk on RAM as the block device files (/dev/rb*) to the user-space. In other words, the four files ram_device. * and partition. * form the horizontal layer of the device driver and ram_block.c forms the vertical (block) layer of the device driver. So, let’s understand that in detail. Block drivers are designed to be used by I/O schedulers, for optimal performance. Compare that with character drivers to be used by VFS. Block drivers are designed to be integrated with the Linux’ buffer cache mechanism for efficient data access. Character drivers are pass-through drivers, accessing the hardware directly. And these trigger the implementation differences. Let’s analyze the key code snippets from ram_block.c, starting at the driver’s constructor rb_init(). All these are prototyped in <linux/genhd.h>. and then either process it or initiate the processing. Whatever it does, it should be non-blocking, as this request function is called from a non-process context, and also after taking the queue’s spinlock. So, moreover only the functions not releasing or taking the queue’s spinlock should be used within the request function. This entry was posted in Linux Device Drivers and tagged Block Drivers, Device Drivers, Disk on RAM, LFY, Linux, OSFY, Partitions on April 1, 2014 by Anil Kumar Pugalia. This fifteenth article of the mathematical journey through open source, demonstrates the various techniques of expression simplification using Maxima. Expression simplification can be done in a variety of ways. Let’s start with the simple ones, and then move onto more powerful ones. A simple simplification is to convert a given number into a rational number using ratsimp(). Below follows the demonstration. Is x an even number? Maxima simplification uses the concept of properties of symbols. As an example, note the properties of x in the above demonstration at %i8 and %i16. As already seen in the previous article, expand() expands an expression completely, by default. However, it can be controlled by specifying the maximum power to which to expand for both the numerator and the denominator, respectively. Using factor() can compact the expanded expressions. Moreover, in many cases, we would like to expand it only with respect to only some variable(s). Say, (x + a + b)^2 should be expanded with respect to x. expandwrt() is meant exactly for that. One example of each of these is shown below. Expressions containing logs, exponentials, radicals (powers) can be simplified using radcan(). Rule based simplifications can be achieved using sequential comparative simplification function scsim(). Both of these call for a few examples. Unlike Octave, Maxima by default doesn’t evaluate its expressions, it only simplifies. What it means is that expressions with integers like cos(1), exp(2), sqrt(3), etc. may remain as is in the most simplified form, instead of evaluating to their respective float numerical values. In such cases, we may force the evaluation by passing the option numer. Similar evaluation can be achieved for predicates, using pred. This entry was posted in Mathematics and tagged Algebra, Computer Algebra, Expression Simplification, LFY, Linux, Maths, Maxima, OSFY on April 1, 2014 by Anil Kumar Pugalia.